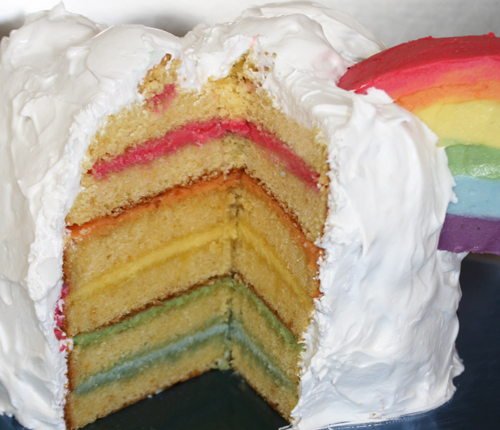 Brightly coloured rainbow cake (layers of colourful cake sandwiched together with white icing) have become so popular now, people are always asking if our natural colours can be used to get that effect. While I don’t advise using our colours in the cake as they tend to bake out, resulting in very faded colours, I do however have an alternative which can look as equally impressive. My little baby recently turned 3 and several months before her birthday had decided she wanted a cake with a rainbow and a unicorn. I held off planning the cake just incase she changed her mind, as kids so often do. 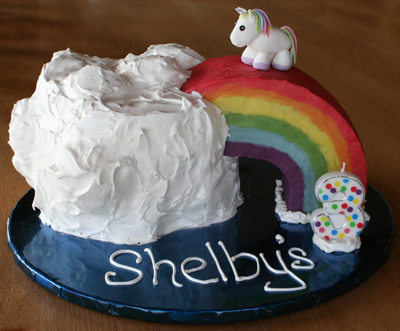 But a few weeks before her birthday she still wanted the rainbow and the unicorn (hurray I was really looking forward to this one!) Of course I was asked if the cake would be rainbow inside and that got me thinking about how to get the look without cooking my colours. The obvious sollution I came up with was to bake a plain cake (I actually made lemon cake) and then use coloured icing to get the desired rainbow effect. I think one very important part of getting this look to work is to have even sized layers of cake in between the icing. I baked three cakes and using a cake leveler, cut each cake into two equal height layers. I made this part of a cake into a cloud cake, so spent some time sculpting the shape of this. I coloured buttercream icing in 5 different colour, this also needed to be applied at a fairly even thickness. Once the cake layers where all assembled I covered my cloud with beautifully fluffy white Italian Meringue. I thought the cake turned out well and so did my daughter and all the party guests. – Dr Seuss, Happy Birthday To You!